Get involved and have fun too! Volunteer for the Yolo Basin Foundation. You’ll meet new people, increase your knowledge of natural habitats and local wildlife, and help support environmental stewardship in our community. Volunteers can get involved in a variety of ways and times that suit the volunteer’s own schedule. There are no set weekly time commitments. We value the time and energy volunteers contribute to our mission, and we want volunteers to enjoy what they are doing. Throughout the year Yolo Basin Foundation offers volunteer-only field trips, ongoing education, and parties including our Annual Volunteer Picnic and Winter Potluck. Assist with Yolo Basin Foundation’s Bat Talk and Walk program. This program runs June to September. Volunteers are required to attend a one-evening training which covers Bat FAQs, room and lobby set-up guidelines, and viewing of nightly fly-out of bats. Volunteers assist with room set-up, will greet and sign-in guests, sell merchandise, answer general questions, and help ensure guests have a memorable evening. Volunteers agree to assist with a minimum of three Bat Talk & Walk programs throughout the summer. Volunteer shifts begin between 5 and 6 p.m. and finish between 9 and 10 p.m., depending on the time of sunset. 2019 Training: Tuesday, June 4 from 6:30 to 9:30 p.m.
To sign up, please fill out the volunteer application at the top of this page and register for the training date! If you have any questions or need assistance, please contact Chelsea at (530) 757-3780 or chopkins@yolobasin.org. 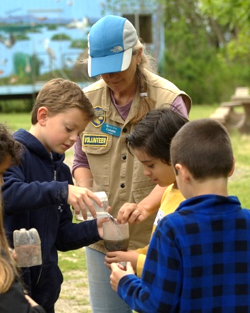 If you have a passion for conservation, an enthusiasm for sharing this with kindergarten through 12th-grade students, and a desire to learn more about local wetlands, then become a docent with Discover the Flyway! 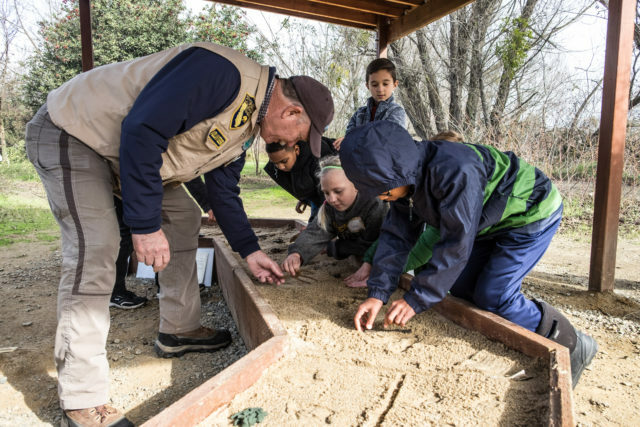 Docents lead hands-on learning stations, assist with field supplies, help develop program tools, and team up with staff to co-lead and assist with Yolo Bypass Wildlife Area tours and nature walks. Volunteer shifts are weekdays throughout the school year from approximately 8 to 11:30 a.m. for activity stations and 11:30 a.m. to 2 p.m. for Wildlife Area tours. Docents commit to lead, assist or shadow a minimum of three times a month. Discover the Flyway docents participate in a comprehensive training that provides an introduction to wetlands and how to lead each of the learning stations. Lead or assist public tours of the Yolo Bypass Wildlife Area. 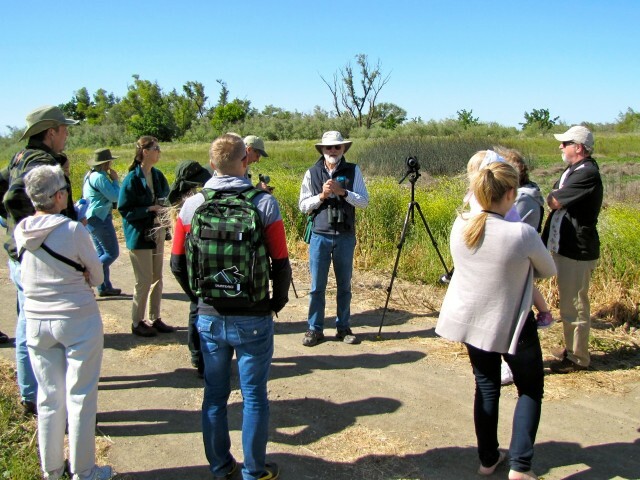 Learn and share fascinating facts about the history of the Wildlife Area and the Bypass as well as promote the Yolo Basin Foundation to tour participants. Potential docents should have an interest in public speaking, the natural history of wetland and riparian species, and conservation. Certification in first aid and CPR is desirable but not required. Binoculars and a spotting scope, in addition to trip log and first-aid kit, are provided for the tours. A personal bird identification guide and binoculars or scope are recommended. All docents must carry a cell phone on tours in the case of an emergency. YBWA docents become experts on local birds and the natural history of this unique and multi-functional ecosystem. Tours are the 2nd Saturday of the month, October to June. 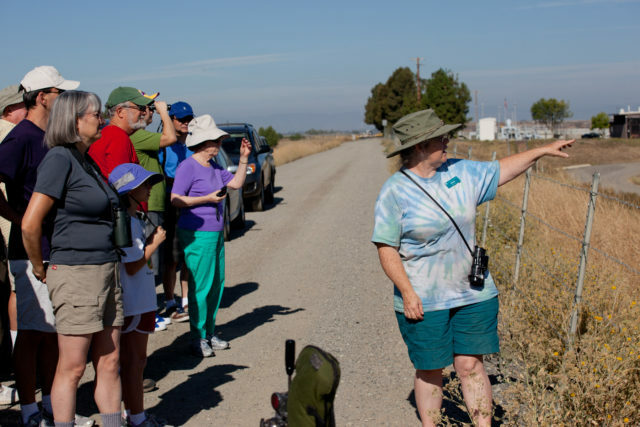 Yolo Bypass Wildlife Area Docents participate in a multi-day training and commit to lead or assist with three 3-hour tours a year. Help educate the public about our local wetlands by leading and assisting with monthly tours of the City of Davis Wetlands. The multi-day training will cover the history of the Waste Water Treatment Plant and the Davis Wetlands, habitats, basic bird and plant identification, use of binoculars and spotting scope, and an introduction to interpretation. New docents are required to attend the training session given once per year. Docents are required to lead or assist with at least two 2-hour tours per year. Tours occur the first Saturday of every month. 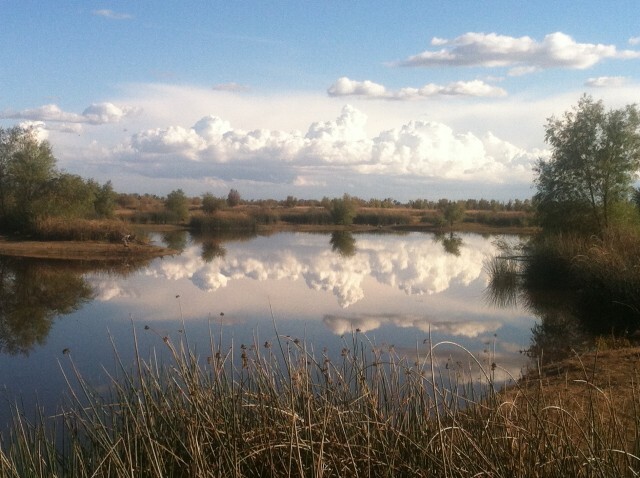 A background check through the City of Davis Police Department is required for all Davis Wetlands docents. Throughout the year, Yolo Basin Foundation organizes special events such as Bucks for Ducks and California Duck Days. Our volunteers are our number one resource for making these events a success. Bucks for Ducks, our annual gala fundraising event, requires nearly 100 volunteers! California Duck Days includes a Welcome Reception and the full-day Festival. 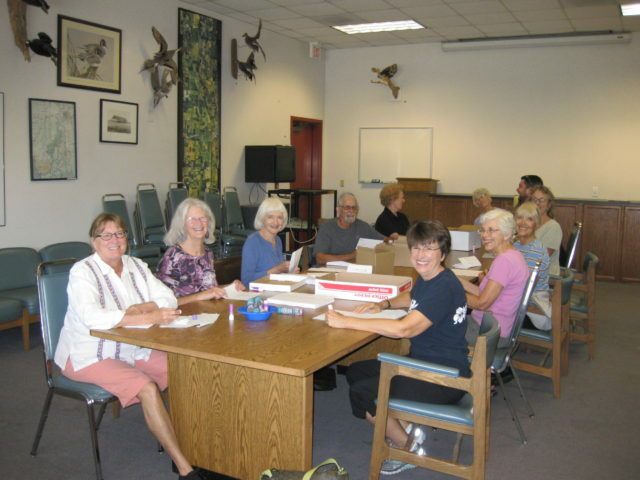 Additionally, volunteers are needed for several smaller special events and projects such as mailings, tule harvesting, data-entry, and clean-up days. Episodic volunteering is a fantastic way for busy individuals to support Yolo Basin Foundation in a way that fits their schedule.